Prepared to capitalize on British civilian interest in the First Boer War. 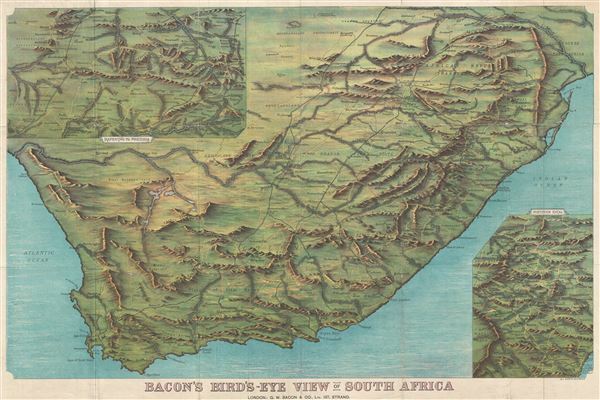 Bacon's Bird's-Eye View of South Africa. An impressive c. 1890 chromolithograph view and map of South Africa extending from the Limpopo River to Cape Agulhas and from the Atlantic to the Indian Oceans. The view details roadways, rivers, towns and cities, rivers, mountains, and other political and geographical features. An inset in the upper left details the region from Mafeking (Mahikeng) to Pretoria. A second inset the lower right details northern Natal (KwaZulu-Natal). This view was most likely prepared to capitalize on British civilian interest in the Boer Wars. The Boer Wars were fought during 1880–1881 and 1899–1902 by the British Empire against the settlers of two independent Boer republics, the Orange Free State and the Transvaal Republic. The wars were in essence part of the British Empire's efforts to consolidate its holdings in South Africa. There were at least three different editions of this view with our research suggesting this is the first. Subsequent variant editions appeared in 1899, in time for the Second Boer War, and around 1901. This example of the view retains, but is detached from, original paper covers. Good. Backed with archival tissue. Some damage and repairs on original fold lines.